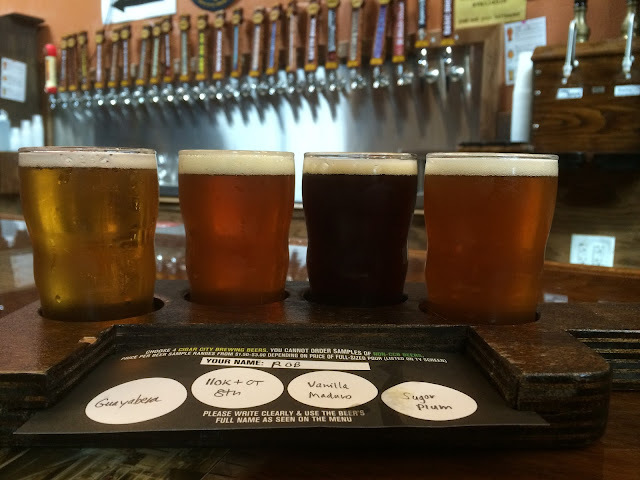 Earlier this week, my wife and I took a quick two day-one night trip to the Tampa area to check out a few breweries. Well, a few or 12. I hadn't been in the area for a few decades, so experiencing the Tampa beer scene was a totally new thing for me. 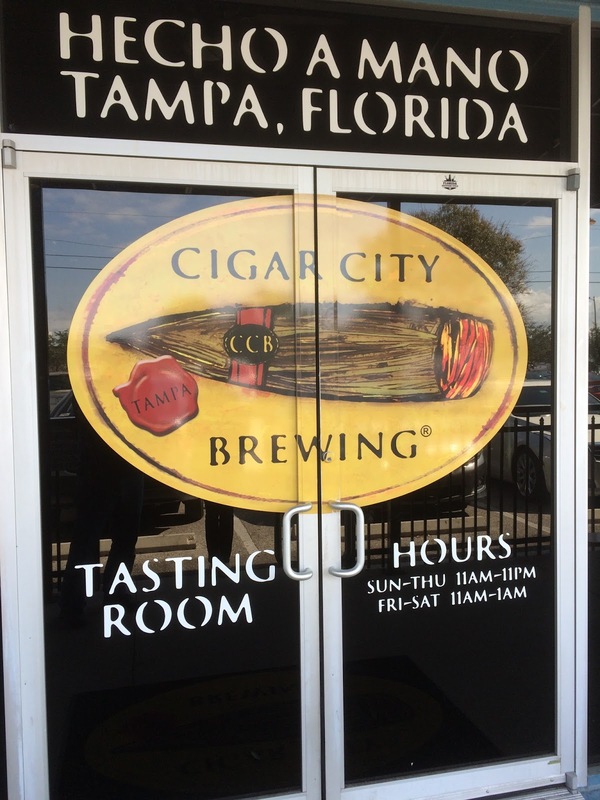 #EpicTampaBreweryTour commenced! I spent a bit of time researching the trip, seeing what breweries were open and at what times, if they offered tours, etc. This trip was on a Monday and Tuesday, days many breweries don't even open their tasting rooms, so I had to overcome that as well. I also got a lot of information and suggestions on Twitter, so thanks for that if you participated. I'll share a map/route when I'm done recapping all the stops. Could be helpful for your next visit! 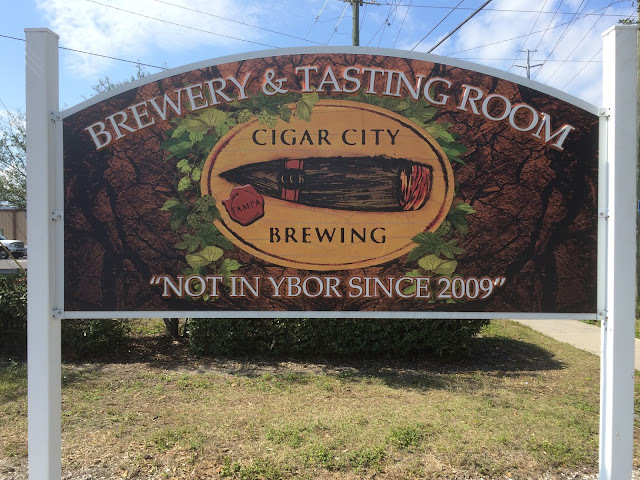 We decided to start at the famous Cigar City Brewing. Monday and Tuesday, no tours. I did make a special tour request but never heard back. They probably get that all the time. So we bellied up to the bar just before noon and ordered a flight. Guayabera had a sharp lemony citrus flavor, nicely bitter; 110K+OT was awesome, rich and sweet fruity orange with a bitter finish; Vanilla Maduro had a great smooth brown ale base and over the top vanilla flavors. Sugar Plum showed dark fruit, maybe chocolate, light coffee bitterness. My favorite was the 110K+OT while my wife chose Vanilla Maduro and had an epiphany that brown ales are her thing! 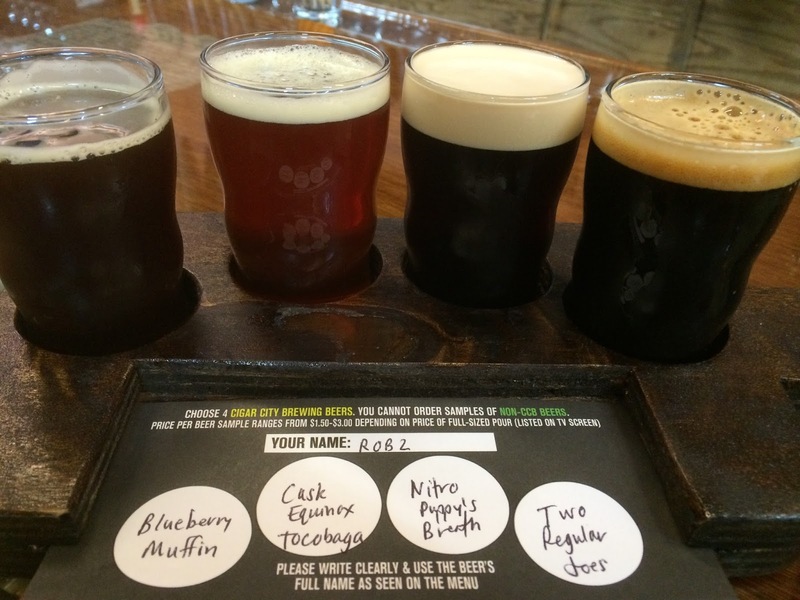 Blueberry Muffin is another great brown ale with just enough blueberry flavor--my favorite of this flight. My wife preferred the Puppy's Breath on Nitro, super creamy and very flavorful. She also said that she knows what a puppy's breath smells like and is happy this was nothing like that! The Equinox-hopped Tocobaba on cask had lots of sharp and bright hoppy flavors, spicy, but that "just cool temp" and "sorta flat" cask thing just doesn't do it for me.Two Regular Joes had rich chocolate with a hoppy bite and dark fruit and vanilla nuances, definite alcoholic kick. The tasting room has two bars separated by a retail area with shirts and caps, etc. There are knick-knacks and signs and medals and framed items all over the walls. 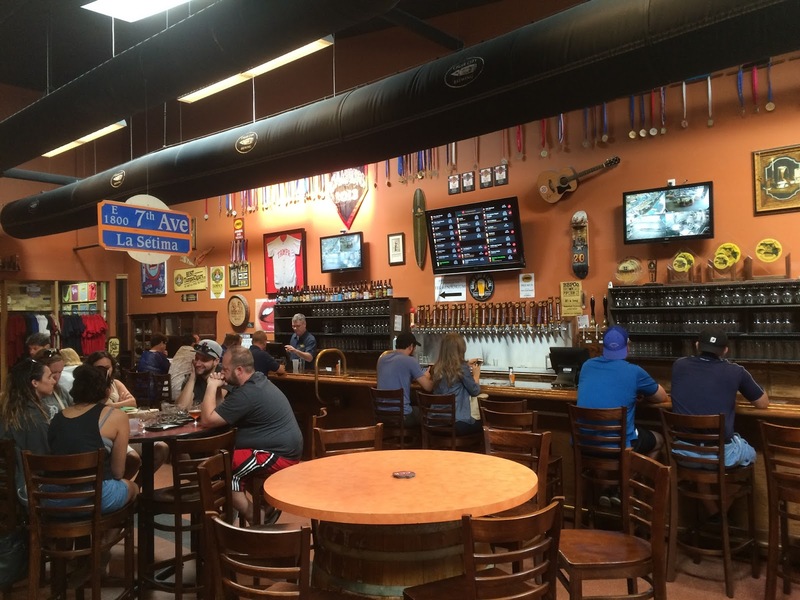 Reminded me more of a larger-sized home bar than a brewery. 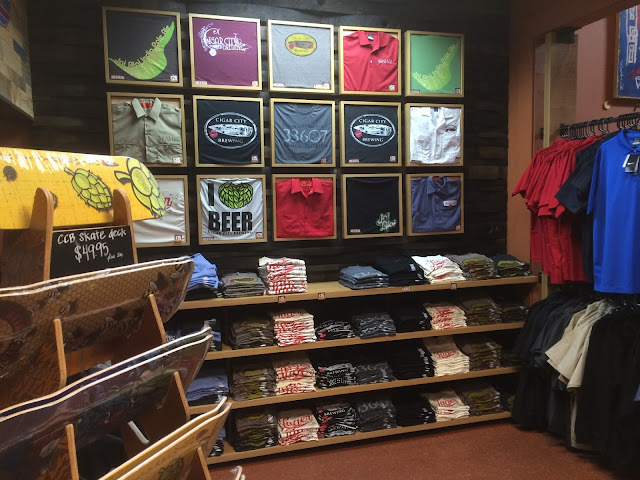 I never saw anything that really said, "you're at a brewery (and definitely not one with world renown)." 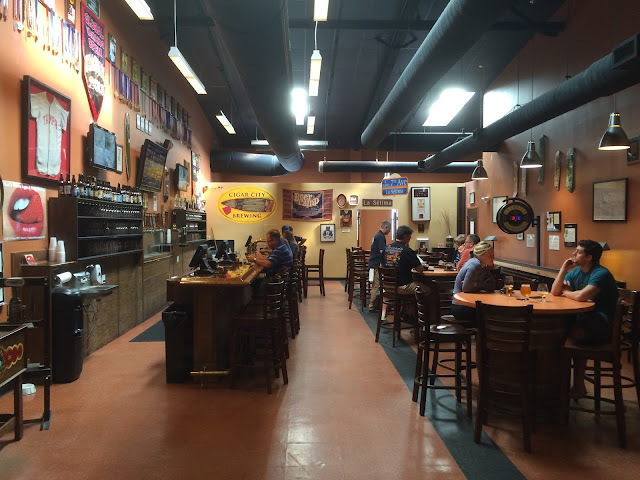 No brewing equipment, tanks, kegs... all of that was apart from the tasting room experience. Granted it was noon on a Monday, but even with 15 or 20 people there, the atmosphere seemed a little strange. There was no music and just whisper chatter for the first half hour we were there. They did eventually put on music, people started talking, games started being played, and the church luncheon softness was dropped. Anyway, first impression. 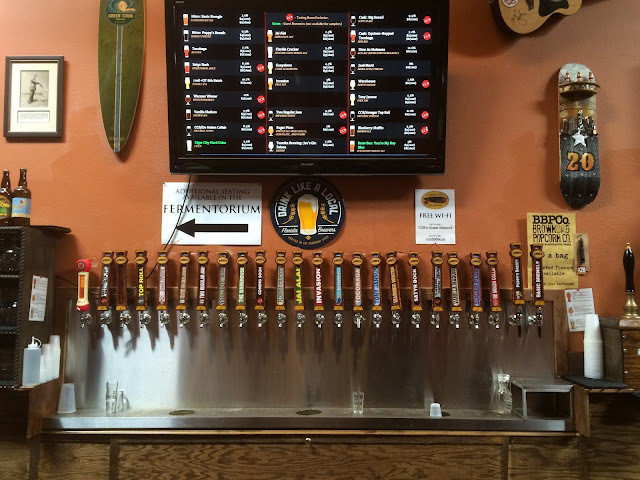 Our bartender was super knowledgeable and the beers were all terrific. Anyway, nice visit and a must stop for everyone! 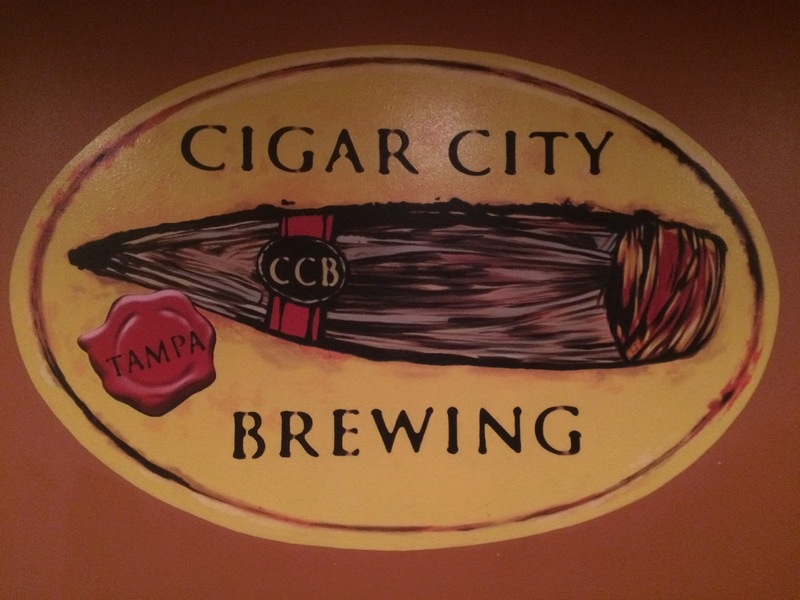 Next stop... Tampa Bay Brewing Company.